House and Garden Roots Excelurator has quickly become known as the most powerful root stimulator system currently available for both commercial and private gardeners, this highly innovative system works overtime to rid your garden of roots and diseases. It also provides a massive boost of root mass while maintaining a strong root environment for a healthy growth span. House and Garden Roots Excelurator forms a film around the roots that act as a membrane to protect the root from harmful germs and illness while still allowing nutrients to enter It even works to isolate germs and keeps them from reforming. This is perhaps the most amazing product in the House and Garden Hall of Fame as it has received rave reviews and has the best results of any root stimulator on the market. Directions for use: Prepare your container and add the base nutrient as per usual. Then make sure the EC level is correct before adding House and Garden Roots Excelurator. Never mix the nutrients in their concentrated form nor mix out of order. Adjust your pH levels according. Be sure to adhere to the plant specific directions for your crop when adding this to your growth system routine. Dilution rate 0.3ml of Roots Excelurator will make 1 litre of usable nutrient solution. 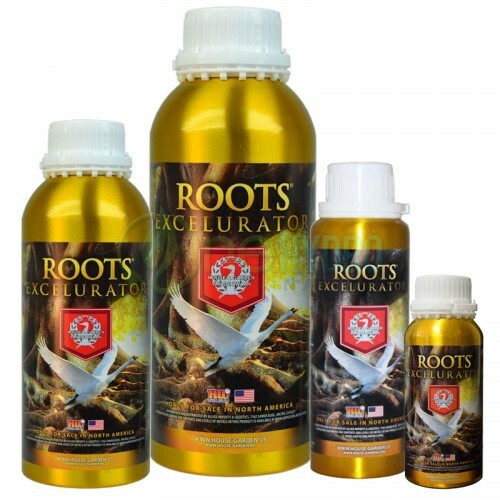 A 250ml bottle of Roots Excelurator will produce over 800 litres of nutrient solution!